Kit grew up in Berkeley, where his father was the president of the family’s architecture firm, The Ratcliff Architects, which Kit’s grandfather had founded. Kit’s mother was also a graduate of architecture but later working as a landscape architect, designing gardens while raising the children. With a family of eight and busy lives, the chance to escape to the mountains was something that was always looked forward to. Kit’s father was involved in the Sierra Club at Clair Tappaan Lodge in Norden. He helped design and build some of the structures. His father designed the Hutchinson Lodge there. This allowed the Ratcliffs to spend time in the Sierras, skiing at Sugarbowl on Donner Summit. 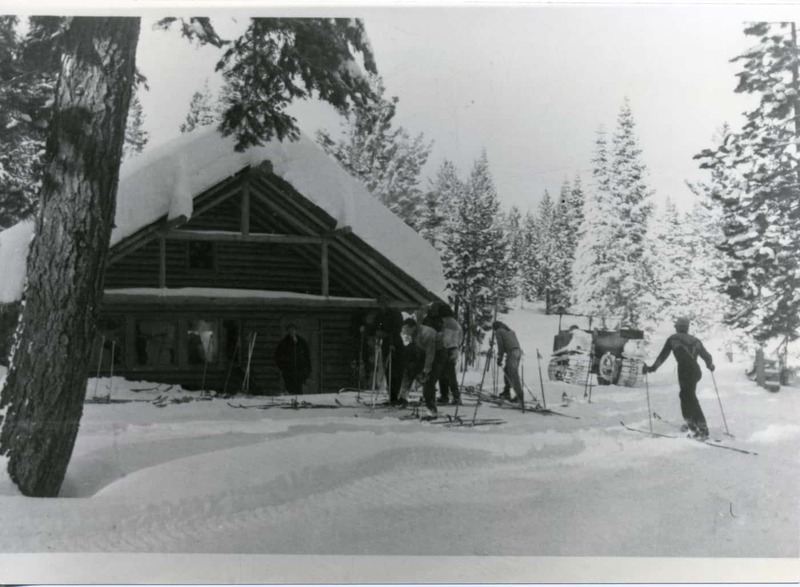 Kit’s father skied with his kids for many years out of the Clair Tappaan Lodge on the slopes of Sugar Bowl. 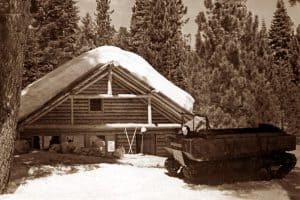 Back in the 1950s, there were three buildings at Granlibakken—the ski hut, the Rustads’ home, and a duplex rented to visitors. When visiting Granlibakken, the Ratcliffs would rent out the west side of the duplex, bringing the whole family up from Berkeley to enjoy some time in the peaceful wooded valley. Kit remembers being picked up by Odd Hodne, Granlibakken’s in-house handyman. Kit describes Odd as “a man of few words—he didn’t talk much, but he was strong and got a lot of work done.” Odd was integral in the daily operations of Granlibakken Tahoe, and actually lived for a period in the Ski Hut attic during the winter months. The Weasel, used to transport guests, parked in front of the Granlibakken Ski Hut. The Ratcliff family would park their car on Highway 89, close to where Tahoe City Lumber is located now. There was a small phone on the side of the road that connected to Granlibakken. There was also a bridge across the Truckee River, meeting where the existing fire road down to the river is now. They would call Odd, and he would head over in the Weasel to pick up the family and make the short trek across the river and up to Granlibakken. Later, the existing road and Fanny Bridge were built, allowing for easier access to Granlibakken. After disembarking from the Weasel, the Ratcliff family would settle into the duplex. 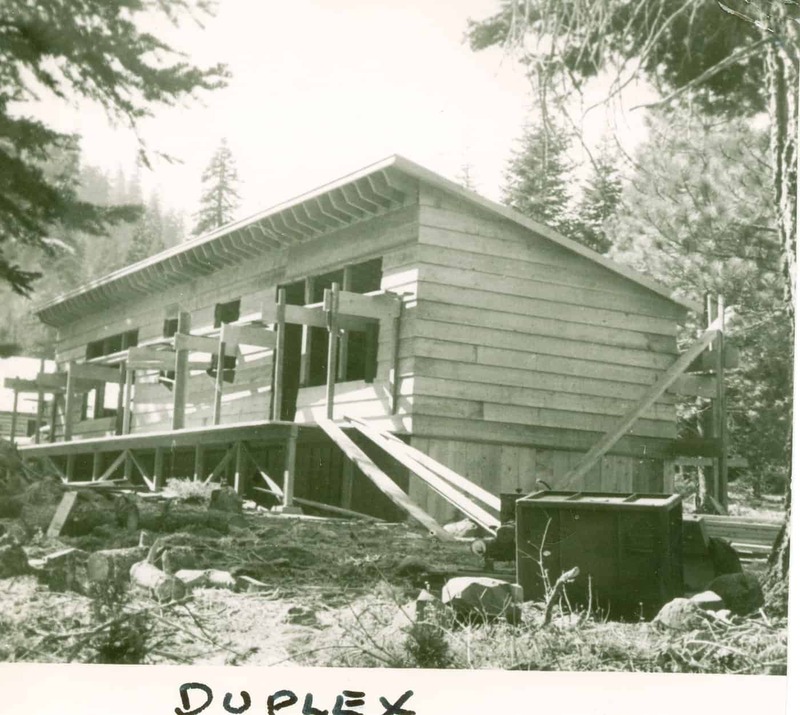 Kjell “Rusty” Rustad’s first wife, Marion, and her daughter, Binth, were in charge of the indoor operations—getting the duplexes ready for guests, and ensuring that the Ski Hut was running smoothly with plenty of food and provisions and a lively fire. Kit secretly admired Binth, who he remembers as a very adept skier, and sometimes would play board games with her in the Ski Hut. Kit remembers that Marion “was very nice, centered, straightforward, and took care of business.” While Rusty was out on the slopes ensuring that the mountain operations went smoothly, Marion in the lodge making sure that guests felt welcome and comfortable. The Ratcliffs rarely left the Granlibakken valley during their weeklong getaways. They would cook all of their meals there, enjoy the snow, and often headed over to the Rustad residence to chat and enjoy a warm fire after hours. The kids would all play games with Binth, and the adults would chat and laugh. Kit remembers Rusty as a serious, ambitious person. He smiled and laughed, but he was all business on the ski slopes. Kit’s family returned to Granlibakken year after year, from when he was ages 8-17, through the 50s. Granlibakken was a great place for the big family, with comfortable lodging at the base of the hill, and plenty of terrain to explore for the kids. In the early days, a rope tow on the east side of the hill offered the only transport to the top of the slope. Kit remembers getting stuck in the rope tow—it would twist, wrapping your sweater or parka in it if you were wearing loose clothing, and skiers would have to pull an emergency release cable that would stop the lift, allowing them to get unstuck. 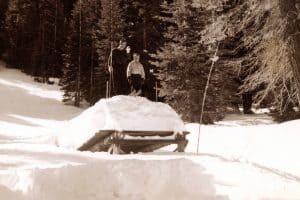 In later years, skiers bought a metal clamp to grab the tow rope, and even later, a Poma lift to the top of the hill was built. The rope tow was definitely not as luxurious as chairlifts are nowadays—Kit remembers that you had to wear thick leather gloves to grip it, as ordinary mittens would shred when grabbing the cable. 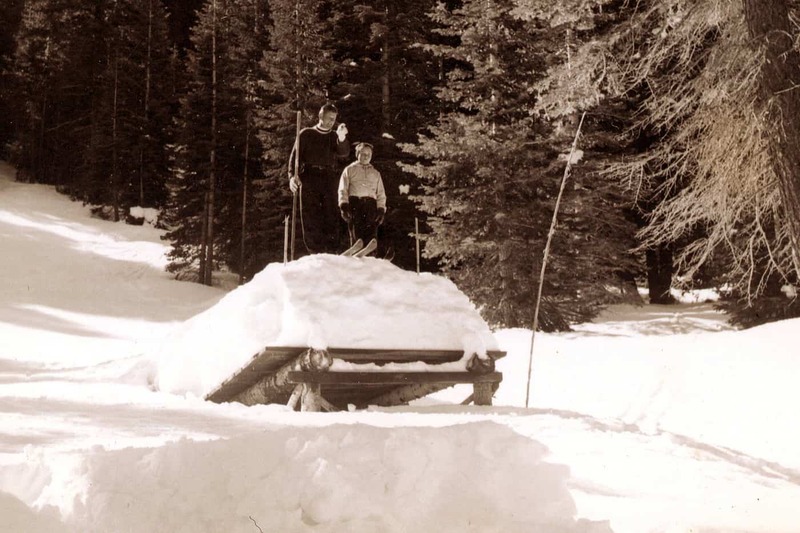 On days when the rope tow wasn’t running, or if they just wanted to explore, Kit and his siblings would put seal skins on their skis, and climb up the Granlibakken hill to enjoy some off-piste terrain and to take laps on the hill. Kit remembers that his old skis had bear trap bindings. These bindings allowed skiers to lock down their heels, or allow the leather ski boots to bend, giving the skis the versatility to be used for both downhill alpine skiing and cross country touring. Kit remembers that Rusty skied with long-thong lace-up bindings. This style of binding was basically a leather strap that wrapped around the skier’s boot and attached to the ski. This style provided added stability back when ski boots were made of leather. There were very specific ways to lace up the binding, and Kit remembers that it could take several minutes to get the lacing correct. The skis used in the 50s were very long by today’s standards. Kit remembers “you’d reach your hand above your head. If the top of your hand reached the top of the ski, then those skis were the right size.” The skis were often made of hickory, or other strong wood, and didn’t have metal edges. Kit remembers one dicey day at Squaw, skiing down Squaw Valley’s Headwall face on an icy day with his wooden skis that had no metal edges…mostly out of control. Kit says that “Rusty was a beautiful skier-totally under control. You would see his head, which would be smooth even though the terrain was bumpy. He had a sense of grace and control while skiing, which was like his personality– graceful and in control.” Many skiers worked to emulate Rusty’s grace while descending the mountain, and his ambition as a business owner was also commendable—he and his family helped to make Lake Tahoe a notable winter destination for folks like the Ratcliffs. Although the Ratcliffs stopped going to Granlibakken as frequently when the kids got older, Kit still has many fond memories of skiing and spending time there. Granlibakken was, and still is, a place where families can retreat from the distractions of their busy lives to take some time to enjoy each other and some warm hospitality. Kit graduated from UC Berkeley with a degree in architecture, and went on to work in London, bringing along his young family. He returned to California in the early 70s, worked in San Francisco, and finally joined the Ratcliff Architecture firm in the East Bay. In the 80s Kit became a partner in the firm, and later began running the firm. Some notable projects that the Ratcliff firm has worked on are Terminal 2 in the Oakland Airport, Berkeley City College and the Berkeley Law addition for UC Berkeley. Kit’s grandfather designed the master plan, the music building and arts center at Mills College. Today, Kit is still involved in The Ratcliff Architects and is working to prepare a new generation of leaders. He is a member of the Berkeley Chorus, and studies piano. He has four daughters, and four grandkids, and he brought his children and grandchildren to Granlibakken to learn to ski when they were young. Kit still visits Granlibakken, and always looks forward to playing the piano in the Cedar House Pub. This entry was posted in 95th Anniversary Blog Series, gutenberg, Uncategorized. Bookmark the permalink.